Are you looking for a high quality projector that is less than $100? PHOOTA is definitely your best choice. PHOOTA projector will reproduce whatever you play with excellent clarity, showing you clear and sharp images. PHOOTA promises to provide you with free repair or replacement if you have any problems during the three years of use. No need to worry about bulbs, lenses, internal accessories, etc. You will be able to simply connect any device around you with these interfaces. 1.The best projection distance is 1.8-2.5m. 3.Dolby sound is not supported. If there's no sound, please turn off Dolby Digital in AppleTV, Blu-Ray players and Amazon Firestick etc. 4.To connect the Android smartphone, you will need a MHL adapter (Not include, device must support MHL). To connect iPhone/iPad, please use a Lighting to HDMI Adaptor (Not included). 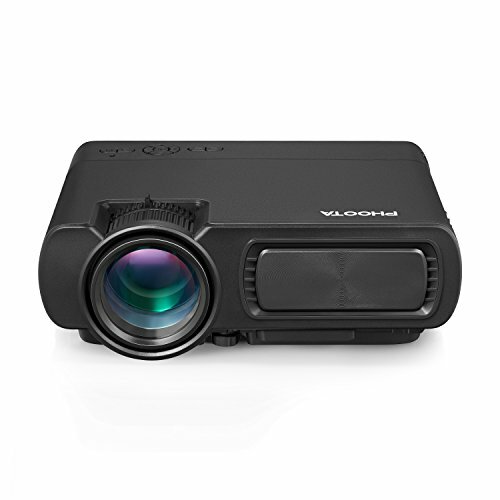 2400 LUMENS LED VIDEO PROJECTOR: PHOOTA has upgraded our projectors to 2400 Lumens. The upgraded projector is 70% brighter and clearer than the other LED mini projectors. You will not regret to buy it in this price range. VERSATILE MOVIE PROJECTOR: This mini projector is compatible with TV Box, Amazon Fire TV Stick, Roku, Chromecast, Laptops, Tablets, Blue-ray DVD player, TF Card, USB Flash Drive, Media players (Music, Pictures, Video, TXT), iPad, iPhone, and Android Smartphones ( Wireless HDMI Dongle not included). 3-YEAR WARRANTY: This HD projector comes with a 3-year warranty and lifetime professional customer service & technical support. Feel free to contact us if you have any problem. If you have any questions about this product by PHOOTA, contact us by completing and submitting the form below. If you are looking for a specif part number, please include it with your message.